Science is a kind of open laboratory for a democracy. It's a way to experiment with the ideals of our democratic societies. For example, in science you must accept the fact that you live in a community that makes the ultimate judgment as to the worth of your work. But at the same time, everybody's judgment is his or her own. The ethics of the community require that you argue for what you believe and that you try as hard as you can to get results to test your hunches, but you have to be honest in reporting the results, whatever they are. You have the freedom and independence to do whatever you want, as long as in the end you accept the judgment of the community. Good science comes from the collision of contradictory ideas, from conflict, from people trying to do better than their teachers did, and I think here we have a model for what a democratic society is about. There's a great strength in our democratic way of life, and science is at the root of it. It's only since the middle 1980s that real progress began to be made on unifying relativity and quantum theory. The turning point was the invention of not one but two approaches: loop quantum gravity and string theory. Since then, we have been making steady progress on both of these approaches. In each case, we are able to do calculations that predict surprising new phenomena. Still, we are not done. Neither is yet in final form; there are still things to understand. But the really important news is that there is now a real chance of doing experiments that will test the new predictions of these theories. This is important, because we're in the uncomfortable situation of having two well-developed candidates for the quantum theory of gravity. We need to reduce these to one theory. We can do this either by finding that one is wrong and the other right, or by finding that the two theories can themselves be unified. LEE SMOLIN, a theoretical physicist, is concerned with quantum gravity, "the name we give to the theory that unifies all the physics now under construction." More specifically, he is a co-inventor of an approach called loop quantum gravity. In 2001, he became a founding member and research physicist of the Perimeter Institute for Theoretical Physics, in Waterloo, Ontario. 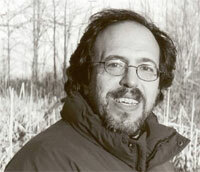 Smolin is the author of The Life of The Cosmos and Three Roads to Quantum Gravity. Several years ago, I had the chance to move to Imperial College in London with the possibility of starting a research group. After I had been there a while, someone came to see me and said, "I represent some people who want to start an institute for theoretical physics. They want it to do fundamental work in things like quantum gravity, string theory, cosmology, and quantum mechanics and they have at least $100 million. What would you do? What fields would be included? How would you structure it? Who would be good to hire? Would you have a director? Would you pick somebody honored and wise and give him all the power to structure it, or would you just hire a bunch of young people out of graduate school and give it to them on a high-tech entrepreneurial model and let them run with it?" We talked about this, and he also talked to many people in these fields—Fotini Markopoulou-Kalamara, Carlo Rovelli, Chris Isham, Roger Penrose, and many others. Very important in these discussions was the structure. My view was that it's wrong to give one person all the power, because this is science, and science functions best when people are independent and there's a community. The proposed institute—the Perimeter Institute for Theoretical Physics, in Waterloo, just outside of Toronto—was particularly meant to be an incubator for innovative ideas about fundamental questions, and new ideas tend either to come from young people or from people who keep themselves young by constantly moving into new areas. We scientists constantly criticize each other, and we work best in an open atmosphere where anybody can criticize anybody, honestly and directly. You also want a supportive atmosphere, where people are generous and sympathetic about difficulties and failures. We talked about all these things, and over time the prospect began to look more attractive than staying in London. The inventor of the idea, and the chief donor to the Perimeter Institute, is Michael Lazaridis, who is co-chief executive of Research in Motion, the company that makes Blackberries. He and the board he created made it clear that what they wanted, structurally, was something like the Institute for Advanced Study, in Princeton. They set the mandate, they set the framework, but they are not involved in day-to-day issues of scientific direction and hiring. Mike is absolutely essential, but he's never come to us and said, "I think you have to hire this person" or "I think that that's not a good direction to go in." One thing they did very early was to create a committee of prominent scientists as advisors, to oversee what we do. They're there to see that we don't wander off in strange directions scientifically—to keep us honest. We're now in a funky old building in Waterloo which used to be a restaurant; my office is next to the old bar. There's a wonderful atmosphere; people love it. Construction has started on a new building designed by two fantastic young architects from Montreal, Gilles Saucier and Andre Perrotte. At the beginning of the process, we traveled with them to Cambridge and London, where people have recently built buildings for physicists and mathematicians, and talked about what works, what doesn't work, and why. I believe that our building is going to be a better place to do theoretical physics than anything that exists now. We already are said by some to be the hot place in two fields—quantum gravity and quantum information theory. We opened in September 2001, which was a strange time to begin any endeavor, starting with three scientists on long term appointments; Robert Myers, Fotini Markopoulou, and myself—a string theorist and two people in quantum gravity. Very much present in our minds from the beginning was the idea that we were not going to favor one particular approach. We have good people in both camps, and we are creating an atmosphere where people in different camps will talk to each other. A lot of good science has happened so far. We hired two very good people in quantum theory: Lucien Hardy, from Oxford, who has done exciting work in foundations of quantum theory and quantum information theory; and Daniel Gottesman, a young star of quantum information theory. In 2002, we had ten postdocs, several visitors, lots of people coming and going. In June, the Canadian prime minister and the minister of industry visited and pledged more than $25 million to our support. The deputy provincial minister of Ontario also came and pledged at least $11 million. It was heartening to see that the leaders of at least one country understand that the support of pure science is essential for a modern democracy. Now I want to talk about the problem of quantum gravity and the two best developed approaches that have been proposed to solve it, which are called loop quantum gravity and string theory. This is a case in which different people have taken different approaches to solving a fundamental scientific problem, and there are interesting lessons to be learned from how these theories have developed since the early 1980s—lessons about space and time and also about how science works. Quantum gravity is the name we give to the theory that unifies all of physics. The roots of it are in Einstein's general theory of relativity and in quantum theory. Einstein's general theory of relativity is a theory of space, time, and gravity; while quantum theory describes everything else that exists in the universe, including elementary particles, nuclei, atoms, and chemistry. These two theories were invented in the early twentieth century, and their ascension marked the overthrow of the previous theory, which was Newtonian mechanics. They are the primary legacies of twentieth-century physics. The problem of unifying them is the main open problem in physics left for us to solve in this century. Nature is a unity. This pen is made of atoms and it falls in the earth's gravitational field. Hence there must be one framework, one law of nature of which these two theories are different aspects. It would be absurd if there were two irreconcilable laws of physics, one for one domain of the world and another for another domain. Even in 1915 Einstein was aware of the issue, and in his very first paper about gravitational waves, he mentions the paradox of how to fit relativity together with the quantum. Until a few years ago, the situation was very different. We didn't know how to test the theories we were working so hard to construct. Indeed, for a whole scientific generation—that is, since the middle 1970s—fundamental physics has been in a crisis, because it has not been possible to subject our theoretical speculations to experimental test. This was because the new phenomena that our theories of quantum gravity predict occur at scales of energy many orders of magnitude greater than what can be created in the laboratory—even in the huge particle accelerators. The scale where quantum physics and gravity come together is called the Planck scale, and it is some fifteen orders of magnitude higher in energy than the largest accelerators now under construction. In quantum theory, distance is inverse to energy, because you need particles of very high energy to probe very short distances. The inverse of the Planck energy is the Planck length. It is where the classical picture of space as smooth and continuous is predicted by our theories to break down, and it is some twenty powers of ten smaller than an atomic nucleus. Because the Planck scale is so remote from experiment, people began to put great trust in mathematics and theory. There were even some string theorists who said silly things like "From Galileo to 1984 was the period of modern physics, where we checked our theories experimentally. Since then, we work in the age of postmodern physics, in which mathematical consistency suffices to demonstrate the correctness of our theories and experiment is neither possible nor necessary. "I'm not exaggerating; people really said things like this. The idea that you could do experiments to test the quantum theory of gravity was mentioned from time to time by a few people through the 1990s, but to our shame we ignored them. One person who proposed the idea forcefully is a young man in Rome called Giovanni Amelino-Camelia. He just ignored everybody who said, "You'll never probe scales that small. You'll never test these theories." He told himself that there must be a way, and he examined many different possible experiments, looking for ways that effects of quantum gravity could appear. And he found them. Now we know more than half a dozen different experiments we can do to test different hypotheses about physics at the Planck scale. Indeed, in the last year, several proposals about Planck scale physics have been ruled out by experiment. The key thing that Amelino-Camelia and others realized is that we can use the universe itself as an experimental device to probe the Planck scale. There are three different ways the universe gives us experimental probes of the Planck scale. First, there are accelerators in distant galaxies that produce particles with energies much higher than we can produce in even the largest human-made accelerators. Some of these ultra-high-energy cosmic rays have been observed hitting our atmosphere with energies more than 10 million times those we have ever produced. These provide us with a set of ready-made experiments, because on their way to us they have traveled great distances through the radiation and matter that fill the universe. Indeed, there are already surprises in the data which, if they hold up, can be interpreted as due to effects of quantum gravity. Second, we detect light and particles that have traveled billions of light years on their way across the universe to us. During the billions of years they travel, very small effects due to quantum gravity can be amplified to the point that we can detect them. Finally, the postulated inflation by which the universe expanded very rapidly at early times serves as a kind of microscope, blowing up Planck scale features to astronomical scales, where we can see them in small fluctuations in the cosmic microwave radiation. So what are the theories we will be testing with these effects? One is loop quantum gravity. Loop quantum gravity started in the early 1980s with some discoveries about classical general relativity by Amitaba Sen, then a postdoc at the University of Maryland. These were made into a beautiful reformulation of Einstein's theory by Abhay Ashtekar, then at Syracuse University and now director of the Center for Gravitational Physics at Penn State—a reformulation that brought the mathematical and conceptual language we use to describe space and time closer to the language used in particle physics and quantum physics. My colleague Ted Jacobson of the University of Maryland and I then found in 1986 that we could use this new formalism of Ashtekar's to get real results about quantum spacetime. Since the 1950s, the key equation of quantum gravity has been one called the Wheeler-DeWitt equation. Bryce DeWitt and John Wheeler wrote it down, but in all the time since then, no one had been able to solve it. We found we could solve it exactly, and in fact we found an infinite number of exact solutions. They revealed a microscopic structure to the geometry of space and told us that space, at the Planck scale, looks like a network with discrete edges joined into graphs. The next year, I was joined by Carlo Rovelli (now of the Centre de Physique Théorique in Marseille), and we were able to make a full-fledged quantum theory of gravity out of these solutions. This became loop quantum gravity. We were quickly joined by many others, and now it is a rather large field of research. Loop quantum gravity differs from other approaches to quantum gravity, such as string theory, in that apart from using Ashtekar's formalism we made no modifications to the principles of relativity and quantum theory. These principles are well tested by experiment, and our theory is based on their consistent unification, nothing more. Our approach joins relativity in the world as we see it, with three spatial dimensions and matter more or less as we see it, with quantum mechanics more or less in the form presented to us by Paul Dirac, Werner Heisenberg, and their friends. While most people had given up and were seeking to modify the principles of either relativity or quantum theory, we surprised ourselves (and many other people) by succeeding in putting them together without modifying their principles. This has led to a detailed theory that gives us a new picture of the nature of space and time as they appear when probed at the Planck scale. The most surprising aspect of this picture is that on that scale, space is not continuous but made up of discrete elements. There is a smallest unit of space: Its minimum volume is given roughly by the cube of the Planck length (which is 10-33 cm). A surface dividing one region of space from another has an area that comes in discrete units, the smallest of which is roughly the Planck length squared. Thus, if you take a volume of space and measure it to very fine precision, you discover that the volume can't be just anything. It has to fall into some discrete series of numbers, just like the energy of an electron in an atom. And just as in the case of the energy levels of atoms, we can calculate the discrete areas and volumes from the theory. When we first worked out the predictions for these smallest units of area and volume, we had no idea that they would be observable in real experiments in our lifetime. However, a number of people—beginning with Rodolfo Gambini, of the University of the Republic in Montevideo, and Jorge Pullin, then at Penn State—showed that there are indeed observable consequences. At about the same time, Amelino-Camelia and others were pointing out that if there were such effects, they would be detectable in experiments involving cosmic rays and gamma-ray bursts. These effects are caused by light scattering off the discrete structure of the quantum geometry, analogous to diffraction and refraction from light scattering off the molecules of the air or liquid it passes through. The quantum gravity effect is tiny—many orders of magnitude smaller than that due to matter. However, we observe light from gamma-ray bursts—huge explosions, possibly caused by mergers of binary neutron stars or black holes—that has traveled across the universe for some 10 billion light-years. Over such long distances, the small effects amplify to the point where they can be observed. Because elementary particles travel as waves in quantum theory, the same thing happens to such particles—protons and neutrinos, for example. It is possible that these effects may be responsible for the surprises I mentioned in the observations of very-high-energy cosmic rays. Now, here is the really interesting part: Some of the effects predicted by the theory appear to be in conflict with one of the principles of Einstein's special theory of relativity, the theory that says that the speed of light is a universal constant. It's the same for all photons, and it is independent of the motion of the sender or observer. How is this possible, if that theory is itself based on the principles of relativity? The principle of the constancy of the speed of light is part of special relativity, but we quantized Einstein's general theory of relativity. Because Einstein's special theory is only a kind of approximation to his general theory, we can implement the principles of the latter but find modifications to the former. And this is what seems to be happening! So Gambini, Pullin, and others calculated how light travels in a quantum geometry and found that the theory predicts that the speed of light has a small dependence on energy. Photons of higher energy travel slightly slower than low-energy photons. The effect is very small, but it amplifies over time. Two photons produced by a gamma-ray burst 10 billion years ago, one redder and one bluer, should arrive on Earth at slightly different times. The time delay predicted by the theory is large enough to be detectable by a new gamma-ray observatory called GLAST (for Gamma-ray Large Area Space Telescope), which is scheduled for launch into orbit in 2006. We very much look forward to the announcement of the results, as they will be testing a prediction of a quantum theory of gravity. A very exciting question we are now wrestling with is, How drastically shall we be forced to modify Einstein's special theory of relativity if the predicted effect is observed? The most severe possibility is that the principle of relativity simply fails. The principle of relativity basically means that velocity is relative and there is no absolute meaning to being at rest. To contradict this would mean that after all there is a preferred notion of rest in the universe. This, in turn, would mean that velocity and speed are absolute quantities. It would reverse 400 years of physics and take us back before Galileo enunciated the principle that velocity is relative. While the principle may have been approximately true, we have been confronting the frightening possibility that the principle fails when quantum gravity effects are taken into account. Recently, people have understood that this possibility appears to be ruled out by experiments that have already been done: that is, if the principle of relativity fails when quantum gravity effects are taken into account, effects would already have been seen in certain very delicate measurements involving atomic clocks and in certain astrophysical processes involving supernova remnants. These effects are not seen, so this drastic possibility seems less likely. So a hypothesis about the structure of space and time on scales twenty orders of magnitude smaller than an atomic nucleus has been ruled out by experiment! But there is another possibility. This is that the principle of relativity is preserved, but Einstein's special theory of relativity requires modification so as to allow photons to have a speed that depends on energy. The most shocking thing I have learned in the last year is that this is a real possibility. A photon can have an energy-dependent speed without violating the principle of relativity! This was understood a few years ago by Amelino Camelia. I got involved in this issue through work I did with João Magueijo, a very talented young cosmologist at Imperial College, London. During the two years I spent working there, João kept coming to me and bugging me with this problem. His reason for asking was that he had realized that if the speed of light could change according to conditions—for example, when the universe was very hot and dense—you might get an alternative cosmological theory. He and Andreas Albrecht (and before them John Moffat) had found that if the speed of light was higher in the early universe, you get an alternative to inflationary cosmology that explains everything inflation does, without some of the baggage. These ideas all seemed crazy to me, and for a long time I didn't get it. I was sure it was wrong! But João kept bugging me and slowly I realized that they had a point. We have since written several papers together showing how Einstein's postulates may be modified to give a new version of special relativity in which the speed of light can depend on energy. Meanwhile, in the last few years there have been some important new results concerning loop quantum gravity. One is that the entropy of a black hole can be computed, and it comes out exactly right. Jacob Bekenstein found in his PhD thesis in 1971 that every black hole must have an entropy proportional to the area of its horizon, the surface beyond which light cannot escape. Stephen Hawking then refined this by showing that the constant of proportionality must be, in units in which area is measured by the Planck length squared, exactly one quarter. A challenge for all quantum theories of gravity since then has been to reproduce this result. Moreover, entropy is supposed to correspond to a measure of information: It counts how many bits of information may be missing in a particular observation. So if a black hole has entropy, one has to answer the question, What is the information that the entropy of a black hole counts? Loop quantum gravity answers these questions by giving a detailed description of the microscopic structure of the horizon of a black hole. This is based on the atomic description of spatial geometry, which implies that the area of a black hole horizon is quantized—just as space is, it is made up of discrete units. It turns out that a horizon can have, for each quantized unit of area, a finite number of states. Counting them, we get exactly Bekenstein's result, with the one quarter. This is a very recent result. When we first did this kind of calculation, in the mid-1990s, we got the entropy right up to an overall constant. A few months ago, in a brilliant paper, Olaf Dreyer, a postdoc at the Perimeter Institute, found a very simple and original argument that fixes that constant, using a completely classical property of black holes. He uses an old argument of Neils Bohr called the correspondence principle, which tells us how to tie together classical and quantum descriptions of the same system. Once the constant is fixed, it gives the right entropy for all black holes. Another big development of loop quantum gravity is that we now know how to describe not only space but spacetime—including causality, light cones, and so on—in loop quantum gravity. Spacetime also turns out to be discrete, described by a structure called a spin foam. Recently there have been important results showing that dynamical calculations in spin-foam models come out finite. Together these two results strongly suggest that loop quantum gravity is giving us sensible answers to questions about the nature of space and time on the shortest scales. Let me now say something about string theory, which is the other approach to quantum gravity that has been well studied. String theory is a very beautiful subject. It attempts to unify gravity with the other forces by postulating that all particles and forces arise from the vibrations of extended objects. These include one-dimensional objects (hence the name "strings"), but there are also higher-dimensional extended objects that go by the name of "branes" (for generalizations of membranes). String theory comes from the observation that all the quanta that carry the known forces, and all the known particles, can be found among the vibrations of these extended objects. String theory is not a complete quantum theory of gravity, for reasons I'll come to in a minute, but it does work to a certain extent. It gives, to a certain order of approximation, sensible predictions for some quantum gravity effects. These include the scattering of gravitons (quanta of gravity analogous to photons) with other particles. For certain very limited kinds of black holes (actually, not real black holes but systems with properties similar to certain special black holes), it gives predictions that agree with the results of Bekenstein and Hawking. And it does succeed in unifying gravity with the other forces. However there is some fine print. For string theory to work, we need to hypothesize that there are six or seven unobservable dimensions of space. We must also hypothesize that there are new kinds of symmetries called supersymmetries, which have not so far been observed. These symmetries tie together particles usually considered constituents of matter (like quarks and electrons) with the quanta of forces (like photons and gluons). There is some indirect evidence that some people take as an indication that supersymmetry is present and will be seen in future experiments in accelerators. But so far no direct evidence for supersymmetry has been found. Nor has there been any experimental evidence for the extra dimensions that string theory requires. The extent to which people can invent imaginary worlds when science gets decoupled from experiment is quite extraordinary. They follow a certain aesthetic of mathematical elegance out there as far as it takes them. If you buy all that—the extra dimensions and symmetries and so forth—string theory does succeed to a certain limited approximation in unifying gravity and quantum theory. However, even if it's right, string theory can be only an approximation to the real theory. One reason is that there turns out to be an enormous number of string theories. And so far, while many of them have been studied, no single string theory has been discovered that agrees with all the observations of our universe. There are three features of the world that no string theory can so far reproduce: the absence of supersymmetry at low energies, the presence of a cosmological constant with positive sign (more on this later), and the complete absence of a certain kind of field—called a massless scalar field—that string theories predict in abundance. Thus it seems likely that even if string theory is true in some generalized sense, the actual theory describing our universe must differ significantly from all string theories so far invented. Another reason that string theory cannot be the final word is that in string theory one studies strings moving in a fixed classical spacetime. Thus, string theory is what we call a background-dependent approach. It means that one defines the strings as moving in a fixed space and time. This may be a useful approximation, but it cannot be the fundamental theory. One of the fundamental discoveries of Einstein is that there is no fixed background. The very geometry of space and time is a dynamical system that evolves in time. The experimental observations that energy leaks from binary pulsars in the form of gravitational waves—at the rate predicted by general relativity to the unprecedented accuracy of eleven decimal places—tells us that there is no more a fixed background of spacetime geometry than there are fixed crystal spheres holding the planets up. The fundamental theory must unify quantum theory with a completely dynamical description of space and time. It must be what we call a background-independent theory. Loop quantum gravity is such a one; string theory is not. The debate between proponents of background-dependent and background independent theories is in fact just the modern version of an ancient debate. Since the Greeks, the argument has raged between those who believed that space and time have an eternally fixed, absolute character and those who thought space and time are no more than relations between events that themselves evolve in time. Plato, Aristotle, and Newton were absolutists. Heraclites, Democritus, Leibniz, Mach, and Einstein were relationalists. When we demand that the quantum theory of gravity be background-independent, we are saying we believe that the triumph that general relativity represented for the relational point of view is final and will not be reversed. Much of the argument between string and loop theorists is a continuation of this debate. Most string theorists were trained as elementary-particle physicists and worked their whole lives in a single fixed spacetime. Many of them have never even heard of the relational/absolute debate, which is the basic historical and philosophical context for Einstein's work. Most people who work in loop quantum gravity do so because at some point in their education they understood the relational, dynamical character of spacetime as described in general relativity, and they believe in it. They don't work on string theory because they cannot take seriously any candidate for a quantum theory of gravity that is background-dependent and hence loses (or at best hides) the relational, dynamical character of space and time. Similarly, at first string theorists were resistant to the idea that the fundamental theory must be background-independent. However, I think that by now almost all string theorists have come around. They did so because there are reasons internal to string theory to believe that the fundamental theory must be background-independent. This is because string theory turned out to be non-unique. While the original hope, back in the 1980s, was that mathematical consistency would suffice to determine the unified theory, it turns out that in fact there are a huge number of equally consistent string theories. Each is as consistent as any other and each depends on a different choice of fixed background. Further, in spite of the huge numbers of string theories we know about, none of them agree with observations on the three points I mentioned above. As a result, in a move called "the second string revolution" in the middle 1990s, string theorists postulated that all the different string theories so far discovered plus an infinite number of so-far-undiscovered theories are but approximations to one unified theory. This theory has been called M theory, but there is no general agreement as to what its principles are or what mathematical form it takes. The idea is that M theory, if it exists, would be background-independent and have all the different background-dependent string theories as different solutions to it. Many string theorists now say that the main problem in string theory is to find M theory and give string theory a background-independent form. But the funny thing is that not many string theorists have tried to work on this problem. The problem is that all their intuition and tools are based on background-dependent theories. When I bother string theorists about this, they tell me it's premature—not time to work on this problem yet. I've had a lot of interesting conversations with the leaders of string theory—Edward Witten, Leonard Susskind, Renate Kallosh, David Gross, John Schwarz, Michael Green, Andrew Strominger, and many others. We clearly disagree about methodology. They tell me I have the wrong idea about how science works. They tell me one cannot hope to solve fundamental problems by attacking them directly. Instead one must follow the theory where it goes. A leading string theorist has said to me several times that "I learned a long time ago that string theory is smarter than I am" and that to try to tell the theory where to go would be to presume that you are "smarter than the theory." Another tells me that string theory works because it is "a very disciplined community" in which the leaders impose an order on the community of researchers to insure that only a few problems are worked on at any one time. I have huge respect for the string theorists as people and for what they have accomplished. Some of them are good friends. At the same time, I think they're wrong about how science works. I certainly don't want to say that I'm smarter than string theory, or than string theorists. But I disagree about the methodology, because I'm sure that fundamental scientific problems are not solved in such an accidental way. Einstein used to complain that many scientists limit themselves to easy problems—"drilling where the wood is thin," as he put it. On one of the few occasions when I talked to Richard Feynman, he said that many theoretical physicists spend their careers asking questions that are only of mathematical interest. "If you want to discover something significant," he told me, "only work on questions whose answers will lead to new experimental predictions." I also learned from the philosopher Paul Feyerabend the importance of conflict and pluralism in science. I read him in graduate school and I felt imediately that, unlike other philosophers I had been reading, he really understood what we scientists actually do. He pointed out that science often develops out of the tension that arises when competing research programs collide. He advised that in such situations one should always work on the weakest part of each of the competing programs. He also emphasized that pluralism in science is good, not bad. According to him, and I agree, science moves fastest when there are several healthy competing approaches to a problem, and stagnates when there is only one approach. I think this is true on every level—in the scientific community as a whole, in a research center or group, and even in each one of us. So while I disagree with the leading string theorists about methodology, this hasn't kept me from working on string theory. After all, they don't own it; its open problems are there for anyone to try to solve. So I decided a few years ago to ignore their advice and try to construct the background independent form of M theory. In the process of inventing loop quantum gravity, we gained a lot of knowledge about how to make quantum theories of space and time that are background-independent. We have a mathematical language, we have a conceptual language, we know what questions to ask, and we know how to do calculations. It turns out that there is a lot of loop quantum gravity that can be generalized and extended by adding extra dimensions and extra symmetries in order to make it a suitable language for M theory. At first some of my friends and collaborators were shocked that I was working on string theory. However, I had an idea that maybe string theory and loop quantum gravity were different sides of the same theory, much like the parable of the blind men and the elephant. I spent about two years working on string and M theory, with the goal of making them background-independent and thus unifying string theory and loop quantum gravity. I did find some very interesting results. I was able to build a possible background-independent formulation of string theory. The most interesting results I found use some beautiful mathematics, having to do with a kind of number called an octonion. These are numbers that you can divide, but they fail to satisfy the other rules, such as commutativity and associativity. Feza Gürsey, from Yale University and his students, especially Murat Gunyadin, have for years been exploring the idea that the octonions might be connected to string theory. Using octonions, I was able to develop an attractive idea (from Corrine Manogue and Tevian Dray of Oregon State University) that explains why space may look three-dimensional while being, in a certain mathematical sense, nine-dimensional. I don't know if the direction I took is right, but I did find that it is indeed not so hard to use background-independent methods to formulate and study conjectures about what M theory is. Working on string theory using the methods from loop quantum gravity was a lot of fun. I was out there with just a few friends, as it had been in the early days of loop quantum gravity, and I made real progress. However, in the last year I put this work aside because of the new experimental developments. As soon as I understood what Giovanni Amelino-Camelia was saying, I realized that this was science and that's what we had to focus on. Since then, it's been a lot harder to wake up and go to work in the morning to an imaginary world with six or seven extra dimensions. There was another piece of shocking news from the experimenters that took me away from string theory—the discovery over the last couple of years that most of the energy in the universe is in a form that Einstein called the cosmological constant.. The cosmological constant can be interpreted as indicating that empty space has a certain intrinsic energy density. This is a hard thing to believe in, but the cosmological data cannot now be explained convincingly unless one assumes that most of the energy of the universe is in this form. The problem is that string theory seems to be incompatible with a world in which a cosmological constant has a positive sign, which is what the observations indicate. This is a problem that string theorists are thinking and worrying very hard about. They are resourceful people, and maybe they'll solve it; but as things stand at the moment, string theory appears to be incompatible with that observation. Meanwhile, loop quantum gravity incorporates a positive cosmological constant extremely well. In fact it's our best case: If there's a cosmological constant, we're able find a candidate for the quantum state of the universe and show that it predicts that the universe at large scales is governed by general relativity and quantum theory. So in the last several months, I've mostly been studying how to make predictions about the new experiments from a version of loop quantum gravity that incorporates a positive cosmological constant. The good thing about science is that you get these shocks from the real world. You can live for a few years in an imaginary world, but in the end the task of science is to explain what we observe. Then you look in the mirror and ask yourself, "Do I want to be out there in eleven dimensions, playing with beautiful math, when the experiments start coming in?"